Sisyphus was punished by the gods for enslaving Death, in a misguided effort to gain the immortality of human beings. The gods punished Sisyphus for his hubris, forcing him to repeatedly push a rock up a mountain. Camus suggests it is not the torture of Sisyphus—his incessant defeat at the top of the mountain when the rock slips back down the hill—that should captivate us. Instead, Camus is fascinated by the moment at the bottom when, unbroken, he begins pushing the rock back up. Despite the ubiquity of the existential condition, Camus suggests that in the myth, “one must imagine Sisyphus happy.” The Wachowskis demand we see Neo, at the moment of defeat at the hands of the computers, as similarly triumphant in his willful resistance. The Wachowskis re-scripting of “The Myth of Sisyphus” as the stuff of science-fiction serves as a reading frame for the latest film from Marvel Studios, Doctor Strange. In Scott Derrickson’s new film, Dr. Stephen Strange (Benedict Cumberbatch) begins as an arrogant brain surgeon convinced of his mastery over life’s problems. However, his fall comes fast: Driving like a lunatic, he suffers a career-ending car accident, ruining his hands. Filled with despair, he turns to a temple in Nepal run by a sorceress, The Ancient One (Tilda Swinton). 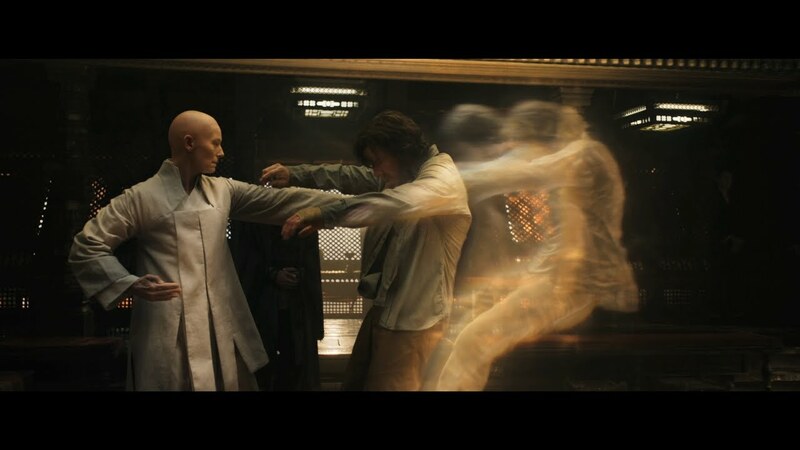 Learning from his master how to astral project, Strange finds himself fighting a different former student of The Ancient One, Kaecilius (Mads Mikkelsen), who has summoned Dormammu, a demon from another dimension. Dormammu has convinced Kaecilius that he will transform the Earth, allowing humans their immortality in exchange for his conquest of the planet. Strange uses an amulet to stop time, trapping Dormammu in a repeated time loop in which, no matter how many times the villain kills Strange, they are forced to repeat the battle yet again. Like The Matrix before it, Doctor Strange creates science-fiction transformed by “The Myth of Sisyphus.” However, it is the villain of Doctor Strange who follows in the footsteps of the Greek hero. Kaecilius turns his back on the teachings of The Ancient One because he sees her as a hypocrite. She denies him the power to save the lives of his loved ones, but draws on the same dark power as Dormammu to extend her life for thousands of years. Like Sisyphus before him, Kaecilius needs to be punished for his desire to make humans immortal. However, it is not the gods who seek to reign in Kaecilius, it is the film’s purported hero, The Ancient One, who demands the enforcement of the mortality of human beings. For his part, Stephen Strange uses the repetition from “The Myth of Sisyphus” in order to negotiate a truce with Dormammu. Unlike Neo, who defines his freedom in a world of enslavement as the choice to get up yet again to take his punishment, it is Strange who forces repetition on a god. Surely it is of tremendous significance when the power of repetition lies not with the gods, but with a human. One of the film’s running gags is that Strange cannot make Master Wong (Benedict Wong), the new librarian of the Kamar-Taj temple, laugh. When Strange uses his amulet to turn back time, fight Dormammu in the repetition loop, and save Wong’s life, the librarian finally laughs. This is the tragicomedy of Samuel Beckett, whose Waiting for Godot (1953) expressed the existential condition as a slapstick comedy. When humans usurp the menacing power of gods, all we can do is laugh at the depraved state of the world. After all, wouldn’t Camus’ happy Sisyphus, properly understood, be the one rightfully capable of turning our tragedy into comedy?